Laser Impressions offers custom laser engraving on all types of items, including promotional items like key chains, luggage tags, flashlights, pens, knives, jewelry, awards, trophies, golf clubs, and business cards. 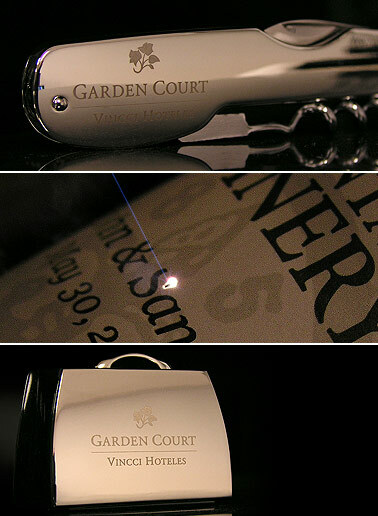 Of course, these are just a few of the almost endless number of items that lend themselves to custom engraving. Our custom laser engraving process lets you laser etch logos, trademarks, slogans and other artwork onto otherwise generic products for use as employee gifts, vendor appreciation gifts, retirement gifts, sales incentives, branded promotional purposes, and much more! Very high quality pictures can be engraved on business cards and jewelry items using our new high resolution (up to 800 dpi) laser etching systems. If you have a product, we can laser mark it, we invite you to call and speak with one of our laser engraving specialists at 1 (800) 344-5273.